Chocolate, peanut, marshmallow. Who ate all the pies? Me, probably. 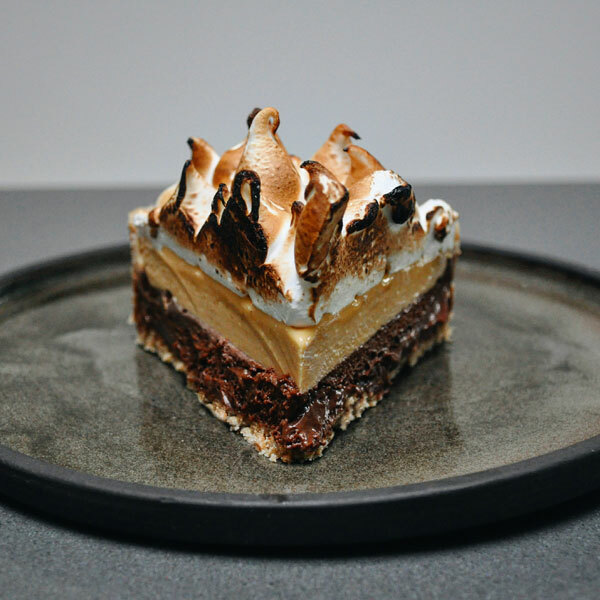 A month or so back, Chris aka All Things Meaty posted up an off-menu S'more cake he had in New York ... and it was the stuff of dreams. I've been tweaking my double-butter peanut mousse recipe recently for an Opera cake, but thought I'd divert attention over to recreating the S'more cake this weekend. This recipe is the result. Since we don't have things like Graham Crackers or pudding cups over here, it's digestives and sabayon mousse instead. Don't give too much of this to your kids, as this thing has sugar for days. Melt your butter in a pan until liquid, then set aside. Take your flan tin and spray it with baking spray or 1cal oil spray. Weigh out your 200g of Digestive biscuits, then put them in a blender and whizz until powder-like. Pour the digestive crumbs into a bowl with the caster sugar, then pour over the melted butter. Use a spatula to blend the ingredients until fully combined and like wet sand. Drop around half of the mix into your flan tin, then shake to level out. Now pour the rest around or near the edges so they can be built up. Press down on the base with the bottom of a mug or, if you have one, a small copper pot. Keep pushing the crust into the base and up the fluted sides of the tin to form a 1/2 cm thick layer by pressing down and rolling the mug or pot around the edges. If the mix starts to come over the top, put your finger level with the top of the tin as you press in order to keep it compact. When you're happy things are looking solid, place on a tray and into your freezer while you carry on. Attach a whisk to your stand mixer, and add the egg yolks to the bowl. Weigh out the caster sugar into a heavy bottomed pot, and place the water in there too. Heat the sugar over a high heat, and turn the mixer up to its highest setting. Regularly measure the sugar's temperature with your thermometer; as soon as it hits 121 degrees C, remove from the heat and carefully pour the hot liquid over the yolks that are being whipped in the mixer. Leave this running until it gets to room temperature. While it's cooling, take another pan and fill it with hot water. Put this over a low heat, and place a bowl over the top to create a bain marie. Add the chocolate into the bowl and gently melt it, then set aside. Finally, when your sabayon is almost cool, whip up the whipping cream to a ribbon stage - not stiff enough to hold a peak, but firm enough to show a trail when you lift the beaters up. Fold the cooled sabayon into the whipped cream, then mix in a third of the chocolate until well combined. Fold in the last 2/3 of melted chocolate more gently. Take the case out of the freezer, and pour the mousse in - you want it to come up about half way so you leave room for the peanut layer. If you have too much, just pour it into a bowl to scoff later. Shake the case (don't tap it or you might break the base) to level out the mix, then put it back in the freezer. This is where it branches off from the chocolate layer. Pour out and reserve the sabayon. Clean the stand mixer bowl, attach a beater instead of a whisk, and whip up the unsalted butter on a high speed. When the butter looks soft, reduce the speed and slowly (and over several additions), spoon the sabayon into the butter while still mixing. Once combined, spoon in the peanut butter and whisk on high again until you have a really soft, thick mixture. Remove the case from the freezer again - your chocolate layer should be set by now (around 30 minutes). Spoon over the peanut mousse and level out with a spatula. Put the case back in the freezer again. Soak the gelatine in some cold water and set aside. Place the 100g of egg whites into your stand mixer with the whisk attachment fitted. Pour 75g of water into a heavy bottomed pot, add the 300g of sugar, and place over a high heat. Use a thermometer to measure the temperature of the sugar - when it hits 115C, start to whip your egg whites. When it hits 118C, remove from the heat, squeeze the excess water out of the gelatine then (carefully, as it will bubble up) drop it into the syrup and mix with a wooden spoon or chopstick. Quickly trickle the hot syrup over the beaten egg whites. Leave this to whisk until completely cool. While this is happening, prepare the piping bag - place the nozzle inside, then put it over a jug so it's easier to drop the marshmallow into - it'll be a sticky job! 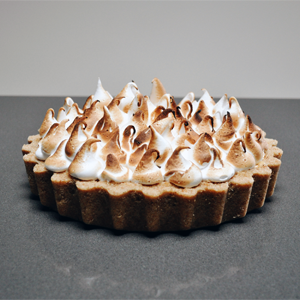 Once the meringue has cooled, stop whisking and fill the piping bag. Try and remove any air bubbles from the bag by pressing the meringue down from the outside, then tie off or clip the bag. Remove the pie from the freezer and snip the top off the piping bag to reveal the nozzle. Start piping the mallows around the edge of the pie. Pull upwards to make them tall as you pipe each one. Once you've finished the complete circle, carry on with the next inner layer, and so on until the entire pie is covered. If you have any left, start piping a second layer over any gaps. When you're happy, fire up your blow torch and burn the lot. Let it defrost before eating - an hour or two at room temperature. The crust is quite delicate, and the mousse layers really light and soft - so you might want to cut slices before it comes up near room temperature. Torch the sliced sides before serving and enjoy responsibly. It will keep for a number of days in the fridge. Unless you eat it.